Keen to front crawl through the sprawl? From London's Serpentine to New York City's Bronx Floating Pool, here are the best places for outdoor city swimming. Nestled amongst the high-rises, historical landmarks and hipster cafes of the world’s cities is a wealth of lidos, river pools and swimming lakes, offering all the benefits of outdoor swimming, but immersed in urban surrounds. Keen to front crawl through the sprawl or wild swim the concrete jungle? From soaking in London’s Serpentine to breaststroke in The Bronx, NYC, here’s a rundown of swimming experiences that really make a splash. From the nation that gave us hygge, Copenhagen’s feel-good, outdoor swimming offerings are unsurprisingly numerous and perennially popular. 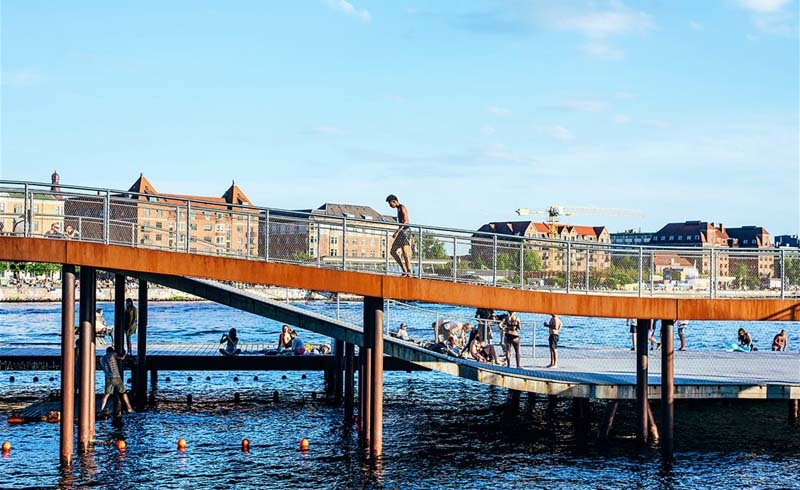 Top of the list are the Islands Brygge Harbour Baths, adorning the city’s picturesque waterfront and boasting uninterrupted skyline views for the locals, families and visiting swimmers taking a dip in their chilly depths. Having opened in 2003 in the quaint Islands Brygge neighbourhood, this collection of pools provides coldwater thrills throughout the summer months, complete with a springboard-studded diving pool for those so inclined. Where to warm up: After a bracing dip, keep the hygge going in Copenhagen’s The Living Room Cafe – a cosy haven of armchairs, cushions and roaring fires in the winter, and uber cool, smoothie-serving space in the summer. 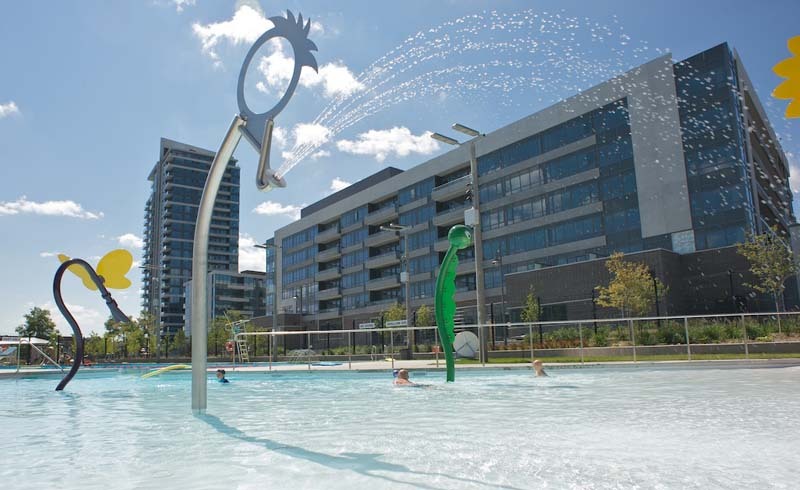 Originally the longest saltwater pool in North America, Vancouver’s spectacular Kitsilano Pool has had to surrender this title since its opening, but has retained its acclaim nonetheless – thanks in no small part to renovations in late 2018. 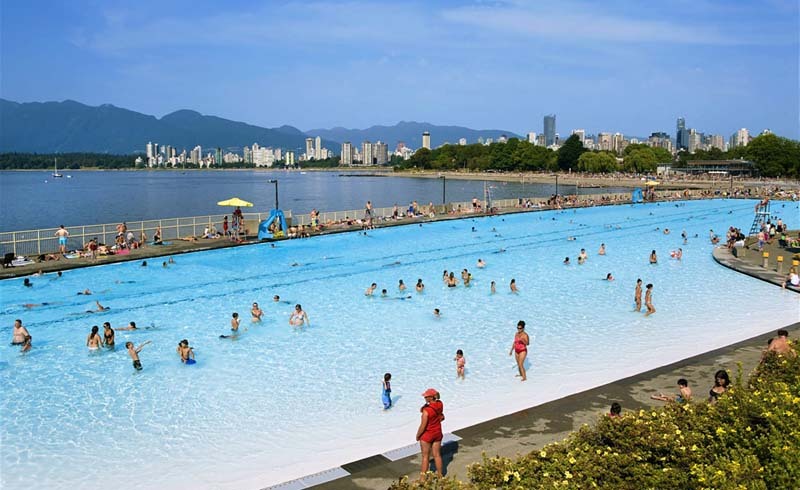 Located along the shoreline of English Bay, the pool combines panoramic views across to the city’s West End with expansive lanes and sun-soaked shallows that are open to all from May to September. Where to warm up: Fancy a fresh French crepe doused in maple syrup after your bayside swim? Nearby Granville Island Public Market is a veritable wonderland of local produce, topped off by a world-class food hall serving everything from sugary crepes to over 200 varieties of tea. Encircled by a wooden jetty jutting out from the shore of Lake Geneva, this chic city pool has you at hello. 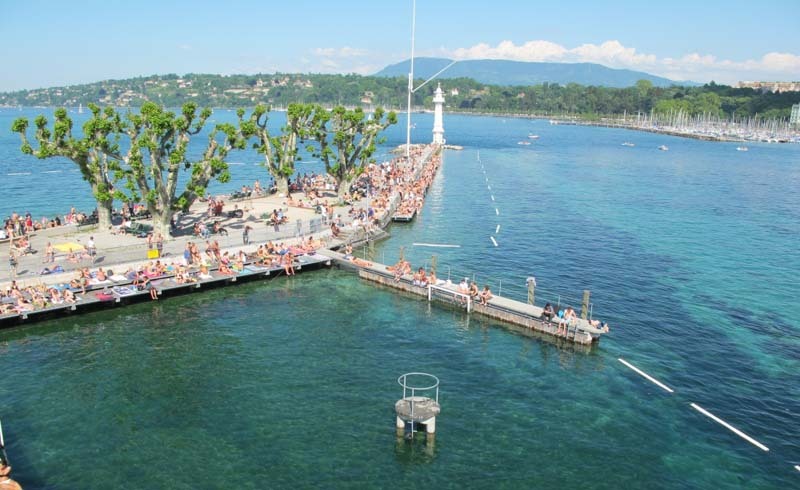 Locals and visitors alike flock to Bains de Paquis as the temperatures rise, but you needn’t fear the summertime crowds – facilities, which include a heavenly sauna and hammam as well as a towering diving platform, are open all year round. Where to warm up: If the adjoining sauna hasn’t warmed your cockles thoroughly enough, head over to Geneva’s renowned Conservatoire et Jardin Botaniques, and thaw out alongside an array of tropical plants in its botanical conservatory. If you can't take the temperature of London's Serpentine, what about staying warm in a wetsuit? London has no shortage of outdoor bathing options, boasting a collection of renowned lidos and the famous Hampstead Heath Ponds – a magnet for fanatical wild swimmers the world over. If it’s urban surrounds you’re after, however, no pool fits the bill better than the city’s Serpentine Lido, located in one of London’s most central green spaces, Hyde Park. Home to the oldest swimming club in Britain, this lido comprises a portion of the Serpentine River, and sees swimmers of all ages and abilities plunging into its bracing depths throughout the summer months. Where to warm up: Just a short stroll out of Hyde Park is London’s V&A Museum, a kaleidoscopic emporium of colour and textiles, complete with the resplendent Garden Cafe where you can sip a steaming hot chocolate or two. Where better to contemplate the world's most famous skyline than the Bronx Floating Pool, NYC? 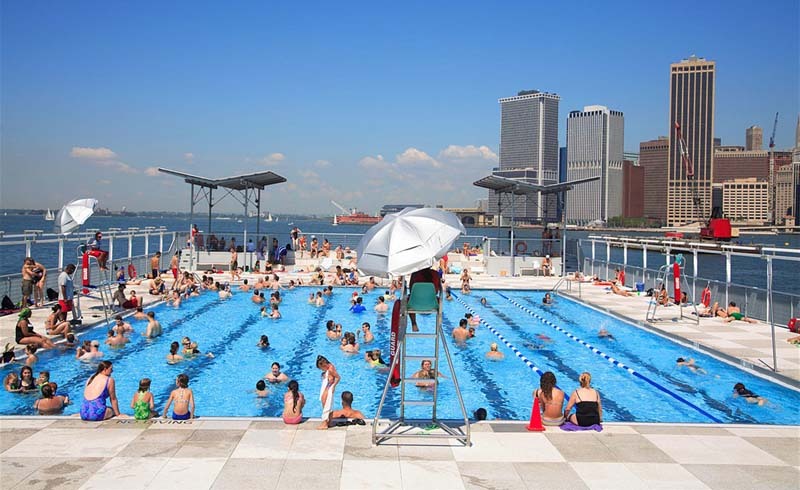 Floating serenely on NYC’s East River and open from June to September, this public pool is surrounded by skyline views of the world’s most famous city. A seven-lane lido built into a barge alongside the Bronx’s Barretto Point Park, the annual opening of this innovative freshwater swimming solution is more than welcomed by the neighbourhood’s locals and is a lesser-known alternative to Queens’ Astoria Pool, which can become overcrowded in the summer. Where to warm up: A boisterous tangle of stalls and bellowing vendors, Arthur Avenue Retail Market is a great place to head after an energising swim to experience The Bronx’s Italian heritage and, more importantly, gobble down pizza by the slice. 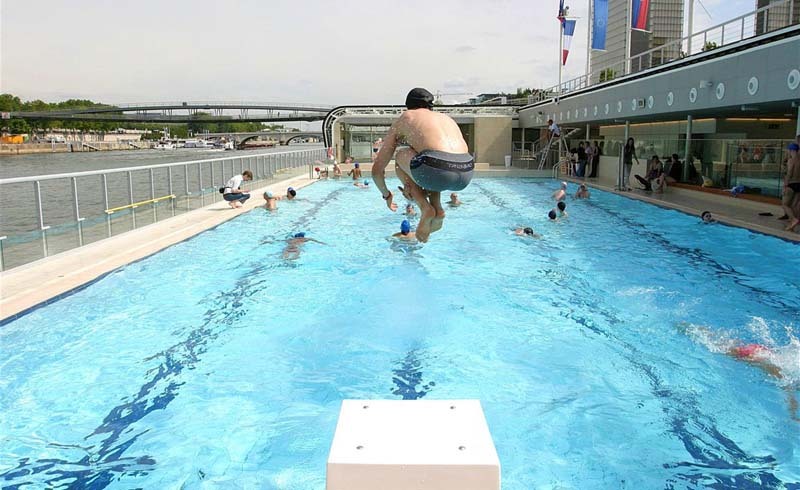 Swimming on the Seine has a romantic ring to it, non? Paris’ innovative Piscine Josephine Baker floats atop the famous river, and despite being slightly tucked away from the bustle of the city centre, more than makes up for it in terms of tranquil suburban surroundings. 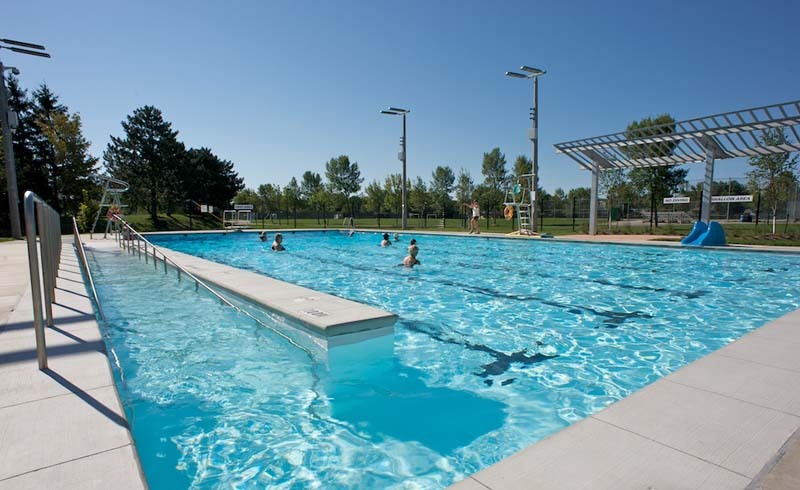 Open throughout the year, the 25m pool complex also features a sauna, small gym and sun deck for thawing out after a refreshing dip. Wild swimming in Icelandic waters may sound suited only to the most dedicated, but Reykjavik’s Nautholsvik Geothermal Beach has just the right amount of natural beauty (and hot tubs) to tempt you in. 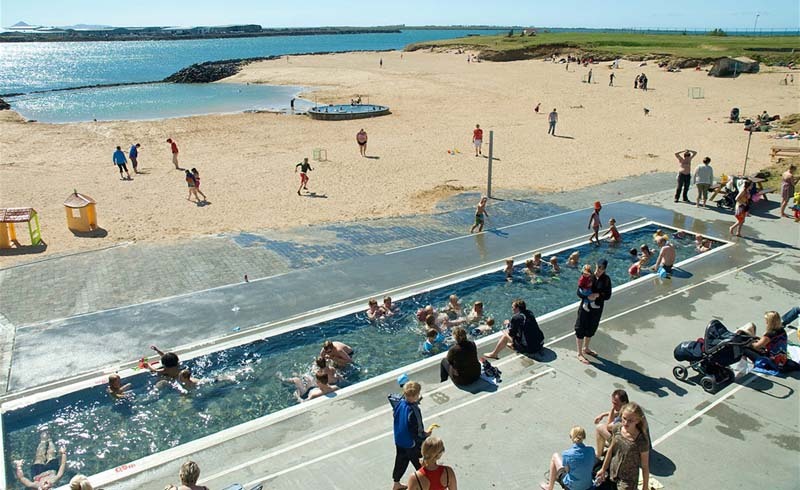 An innovative municipal project completed in 2001, the beach consists of a man-made lagoon where icy sea and hot, geothermal water fuse to create more than pleasant swimming conditions, all with the multi-hued houses of the city within view. As well as a lagoon pool and sea shallows, the beach also features a steam bath for the true Scandi hot-and-cold experience. Where to warm up: If a dip in the hot tub doesn’t quite cut it, give Reykjavik’s ever-eccentric Cafe Babalú a whirl. Cosy, well-worn sofas, shelves of books, board games and roasteries create a warming bonhomie that’ll take the chill off in no time.